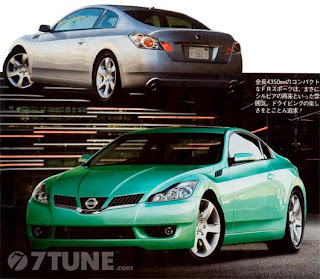 New Nissan S16 Silvia ? "It’s possible that a 2.0L NA engine with a higher output will power the compact FR sports car range, with totally new 1.6L or 1.8L direct injection turbo engines also being considered for the task. The smaller capacity turbo engines are looking favorable at this point, largely due to the inclusion of Nissan’s VCR (Variable Compression Ratio) Piston-Crank System which will improve fuel economy - like that of a small capacity NA engine around town - and also provide high power when needed. The VCR equipped 1.6L turbo engine was mentioned along with the Roundbox concept at last years Tokyo Motor Show so it could very well make it into the compact FR sports coupe. Best Car calculates that around 150ps will be available in high compression mode, with anything up to 225ps in low compression turbocharged mode." Lets see if it gets built.